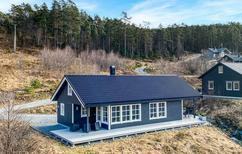 A holiday house in Fjord Norway costs on average USD 625 in the cheap travel period and USD 1,020 in the peak season per week. These details are of course in relation to the house and not per person as well as includes the obligatory additional charges. The Hurtigruten, the old royal freight shipping line is a popular way for travellers in Norway to get to know the fjord coast of the country. Our tip: travel on the Hurtigruten to your holiday home in Norway! This way, you not only avoid the often long and arduous journeys to the most remote areas in Norway, but the journey to the holiday home becomes akin to a cruise, and thus your first holiday experience. 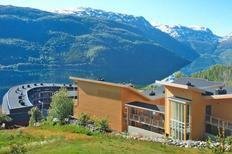 atraveo offers you more than 1,700 properties throughout Fjord Norway. The Hurtigruten has connected the main harbours of the Norwegian fjord coast since 1891. To this day, the ships form an important link to the rest of the country, especially for many places north of the Arctic Circle, such as the island groups of Lofoten and Vesterålen and around North Cape. Very small ships were used in the early days of freight and passenger transportation; these have evolved over time into comfortable cruise ship -like ferries, which offer all kinds of amenities on board. The entire route from Bergen to Kirkenes in south Norway to the Barents Sea is completed daily on a fixed schedule and lasts seven days in total. Then it’s back from North Norway to the mountains, and the places where the ship put into port at inconvenient times during the outbound journey (at night or early morning), will now be reached during the day. Come on a trip along the towns and regions that are visited by the Hurtigruten. Bergen, the starting point for the journey, located halfway between the fjords of Hardangerfjord and Sognefjord, is already worth a stop. The second largest city in Norway, where atraveo can offer you beautiful holiday apartments, will impress you with a number of attractions, leisure facilities and the historic dock area of Bryggen. From Bergen, the Hurtigruten journey proceeds into the small fishing ports of Florø, Måloy, and Torvik in the provinces of Sogn og Fjordane and Møre og Romsdal. One of Måløy’s bizarre main attractions is the Ulvesund bridge where a high C can be produced when the wind whistles in a particular direction. In addition, the north fjord can be reached from here. Torvik is primarily known for the nearby bird island of Runde. The nearest large town of Ålesund will be reached the following morning. Many art nouveau buildings and the Atlantic Park Aquarium constitute popular attractions here. One highlight is the Geirangerfjord, which will be navigated during the Hurtigruten’s summer schedule following the departure from Ålesund. The spectacular panoramas of this fjord will delight you. Because of the lack of a harbour facility, the disembarcation and embarcation will take place at the village of Geiranger by means of ship’s boats, a method that is, incidentally, still very traditional. The journey continues in longer stages via Molde, the capital of the Fylke Møre og Romsdal, and Kristiansund, into the Trondheim fjord and Trondheim, one of the oldest cities in Norway. Many historic buildings around the canal harbour and other attractions make the capital of Sør-Trøndelag a popular travel destination. Among other things, be sure to visit the Stiftsgården, a wooden palace built in the style of classicism. We then proceed along the fjord coast of Nordland via the small ports of Rørvik, Brønnøysund and Sandnessjøen. At Brønnøysund, the legendary Torghatten mountain, which has a bizarre hole in the middle, will impress you. The Arctic Circle will then be crossed between Nesna and Ørnes in the early morning hours. From here, the days will become longer in summer and shorter in winter. The sun will no longer set between May and July the further north you go, while it will not rise in December and January, shrouding the polar region in eternal night. A longer stay is again scheduled for the next stop in Bødø, which can be used to gather information about sea eagles which live here in large numbers. The beautiful islands of Lofoten will be reached in the evening following departure from Bødø. Great excursions can be taken into the surrounding area - both from the stop in Stamsund and from Svolvær, the largest town of the island group. In general, the sections along the Lofoten and the islands located to the north of Vesterålen rank among the most scenic and beautiful visited by the Hurtigruten. The route between Svolvær on Lofoten and Stokmarknes on Vesterålen is particularly spectacular. A special highlight awaits you here during the journey south, as the ship then makes a detour into the particularly narrow Trollfjord. 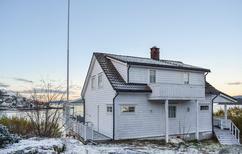 You can also visit the Hurtigruten museum in Stokmarknes, one of the Hurtigruten’s founding places, where you can extensively acquaint yourself with the long and moving history of the company. The journey continues beyond Storkmasnes, via the Vesterålen harbour, Sortland and Risøyhamn to Harstad on the island of Hinnøya. The stunning scenery and wonderful countryside will also tempt you here. After putting into a mainland port again at Finnsnes, opposite the island of Senja, the ship will reach Tromsø. The largest city in North Norway and capital of Fylke Troms is heavily influenced by the polar region. Visit the Polaria Arctic experience and the Polar Museum, which takes you into the exciting history of polar expeditions. Up next, via Skjervøy and Øksfjord, you will reach Hammerfest in the fylke (Norwegian county) of Finnmark, which is called the "world’s northernmost city". At Øksfjord, it is also worth visiting the large glacier of Øksfjordjøkalen which calves here into the nearest fjord. Honningsvåg, the "City of the North Cape", will be reached after Havøysund. There are regular trips from here to the famous North Cape, which is approximately 40 kilometres away. The journey continues via Kjøllefjord to Mehamn, the Hurtigruten’s northernmost port at the Barents Sea. There are excursions from here to the island of Nordkinn, the northernmost point of Norway. The journey proceeds along the idyllic little ports of Berlevaag, Båtsfjord and Vardø. Incidentally, the European Route E75, which runs for over 4,300 kilometres straight through Europe to Crete, starts or ends from here. After the stop in Vadsø, Kirkenes (the Hurtigruten’s final destination) will be reached at last. From here, it is only ten kilometres to the border with Russia and 30 kilometres to the border with Finland. A holiday home vacation up here equates to absolute peace and seclusion. After a four-hour stay, the ships will return from Kirkenes back down south to Bergen. Bergen, the starting point for a trip on the Hurtigruten, can be reached from Germany in several ways. The easiest way is by air to Bergen-Flesland international airport. Another option is to travel by ship (overnight ferry from Kiel) or by plane to Oslo, and to continue from here by train or rental car through the beautiful south of Norway to Bergen. Or set off by car ferry from Hirtshals in Denmark, first to Stavanger and from there on to Bergen. To cover the entire journey by car is a major undertaking which can only be managed in several daily stages, in view of the long distance across the Øresund and south Sweden. Incidentally, your own car can, of course, be taken on board the Hurtigruten ships. Of course, it is also possible to reach all the other places in Fjord Norway on the Hurtigruten, provided that you take along your own car or hire a rental car in Norway. Depending on the destination, there are a few kilometres of road from each respective port that will lead you through Norway’s beautiful landscape.